Search this comprehensive archive for detailed documentation of our work including evaluations, studies, journal articles, publications and more. 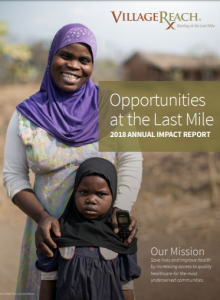 VillageReach’s annual report showcases opportunities and achievements made in 2018 to solve health care delivery challenges in low-resource communities. 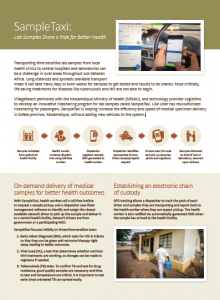 VillageReach partnered with the Mozambique Ministry of Health (MISAU), and technology provider Logistimo to develop an innovative ridesharing program for lab samples called SampleTaxi. Like Uber has revolutionized ridesharing for passengers, SampleTaxi is helping increase the efficiency and speed of medical specimen delivery in Sofala province, Mozambique, without adding new vehicles to the system. 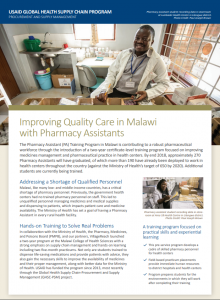 The Malawi Ministry of Health and Population and VillageReach developed Health Center by Phone as a community-based hotline in the Balaka district of Malawi. 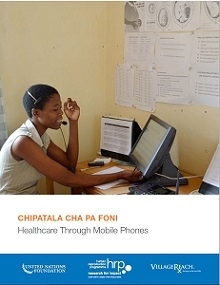 Health Center by Phone extends the reach of the health care system to every community by providing access to certified health and nutrition information and services via a toll-free number. and effective last mile supply chain system. 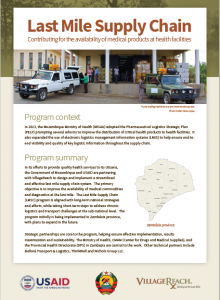 This piece is an overview of the Last Mile Supply Chain (LMSC) program. 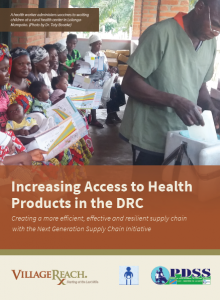 This document focuses on creating a more efficient, effective and resilient supply chain with the Next Generation Supply Chain Initiative in the Democratic Republic of Congo. 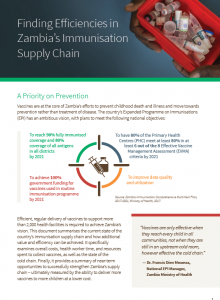 It summarizes the five pillars of transformation, the benefits to the health system, and considerations for scaling or adapting the initiative within and beyond Equateur Province. This case study summarizes the finding from an assessment of the Transport Services Solution (TSS) in Tete province, Mozambique. The case study looks at the specific opportunity for outsourcing and the process that was undertaken to establish this outsourced system. 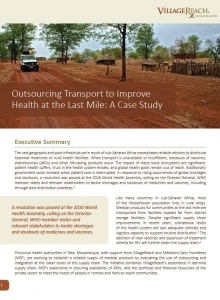 Finally, the case study outlines next steps and considerations for government authorities interested in outsourcing as a way to improve transport for vaccines and other essential medicines. Modeling contributes to supply chain improvements by helping define the best solutions to critical supply chain barriers. 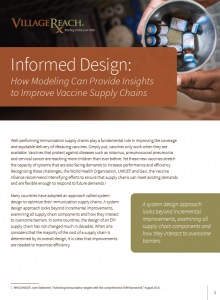 Models must be adapted to a specific context but, done correctly, provide evidence for the feasibility and impact of potential changes to a supply chain. 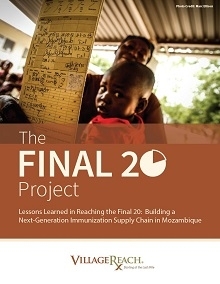 Immunization programs in low and middle income countries (LMICs) face numerous challenges in getting life-saving vaccines to the people who need them. 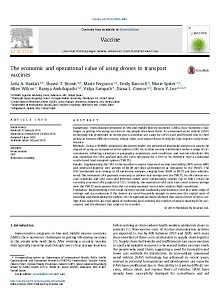 As unmanned aerial vehicle (UAV) technology has progressed in recent years, potential use cases for UAVs have proliferated due to their ability to traverse difficult terrains, reduce labor, and replace fleets of vehicles that require costly maintenance. 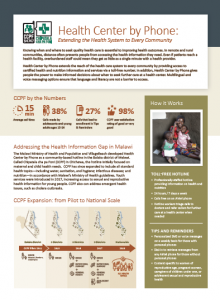 This case study demonstrates how VillageReach approached sustainability and scale for CCPF at the national level through partnerships with the national Ministry of Health (MOH) and a merger with Airtel. 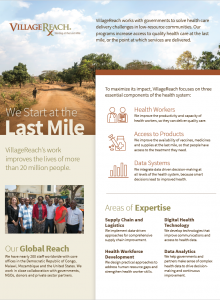 Through this case study, VillageReach shares its lessons learned during the IWG grant program as it pursued sustainability and scale. 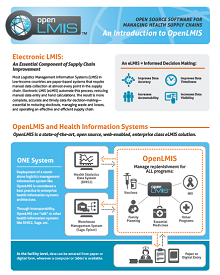 A brief overview of OpenLMIS, a logistics management information system for medical commodities. OpenLMIS is an open source, web-enabled, enterprise class eLMIS solution. Includes current impact and implementations, and benefits.